SoundCloud's controversial automated copyright system has flagged a completely silent track as having "copyrighted content". Facing ever serious threats from rights-holders, SoundCloud has implemented an automated copyright take-down system designed to detect potential copyrighted works and to remove them automatically. But unlike the more sophisticated system employed by the likes of YouTube to police similar copyright offences, SoundCloud's system is far more controversial as it appears to be much less accurate, and much more stringent than YouTube's ContentID. And with SoundCloud's content library being remix heavy, and the very definition of a remix suggesting some part of an original, copyright work is present, SoundCloud's new copyright policy has not been popularly received. And among SoundCloud's loudest, and potentially funniest opponents is DJ Detweiler, producer of the infamous 'Ciley Myrus - Wrecking Ball' remix (the recorder-fueled remix is one of DJ Detweiler's many tracks that was removed by SoundCloud). 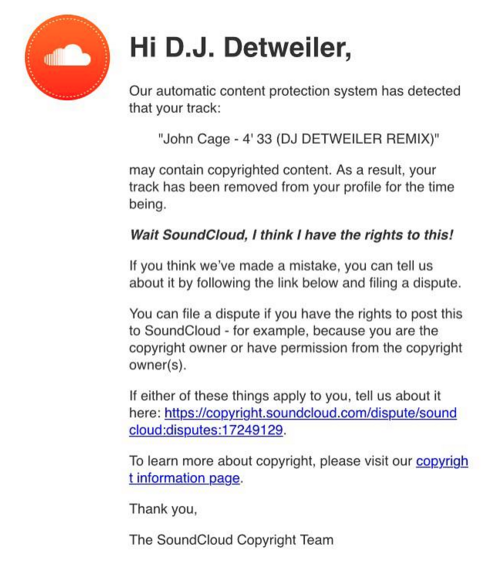 In an attempt to protest and troll SoundCloud's automated copyright take-down system, DJ Detweiler uploaded a "remix" of John Cage's 4'33. A completely silent, blank remix (which technically is still a remix), and one that should not fall foul of SoundCloud's system. But it did. Apparently, SoundCloud's copyright scanning consists merely of looking at the title of the track, with little or no effort in actually scanning the content of the track for actual copyright infringement. A flaw in the system that DJ Detweiler had wanted to expose in the first place. With most of his tracks falling victim of SoundCloud's copyright system, DJ Detweiler has recently replaced all of his remixes with parodies of the infamous "message from SoundCloud" message that plays in lieu of removed copyrighted tracks.